Picking up with the fourth section of Chapter 2…. Chapter two of the encyclical is divided into six sections. The truth revealed by faith enters into dialogue with the truth discovered by reason. This dialogue is seen in the early encounter of Christianity with Greek culture. …the first Christians found in the Greek world, with its thirst for truth, an ideal partner in dialogue. The encounter of the Gospel message with the philosophical culture of the ancient world proved a decisive step in the evangelization of all peoples, and stimulated a fruitful interaction between faith and reason which has continued down the centuries to our own times (32). The dialogue of faith and reason is also clearly seen in the mind and work of Augsutine. In the life of Saint Augustine we find a significant example of this process whereby reason, with its desire for truth and clarity, was integrated into the horizon of faith and thus gained new understanding (33). a philosophy of light capable of embracing both the reciprocity proper to the word and the freedom born of looking to the light. Just as the word calls for a free response, so the light finds a response in the image which reflects it (33 emphasis added). This philosophy finds its point of integration in the encounter with the radiant face of Jesus. The light becomes, so to speak, the light of a word, because it is the light of a personal countenance, a light which, even as it enlightens us, calls us and seeks to be reflected on our faces and to shine from within us (33 emphasis added). Because the light of truth is revealed in an encounter with the Other, it cannot be used to manipulate or control others. It is a truth of love which leads to openness and humility. Clearly, then, faith is not intransigent, but grows in respectful coexistence with others. One who believes may not be presumptuous; on the contrary, truth leads to humility, since believers know that, rather than ourselves possessing truth, it is truth which embraces and possesses us (34 emphasis added). The light shining from the encounter with Jesus is not simply a spiritual light, unconnected to the material world. Because of the incarnation, the radiance of faith enlightens all things and reveals the natural order of reality. … the light of faith is an incarnate light radiating from the luminous life of Jesus. It also illumines the material world, trusts its inherent order and knows that it calls us to an ever widening path of harmony and understanding (34). This light of faith benefits science as well by calling it to move beyond itself, recognizing the transcendent and retaining a sense of wonder. The gaze of science thus benefits from faith: faith encourages the scientist to remain constantly open to reality in all its inexhaustible richness. Faith awakens the critical sense by preventing research from being satisfied with its own formulae and helps it to realize that nature is always greater. By stimulating wonder before the profound mystery of creation, faith broadens the horizons of reason to shed greater light on the world which discloses itself to scientific investigation (34). It’s odd what sticks with you over time. When I was in ninth grade I wrote a paper on evolution and creation. Fundamentally my conclusion hasn’t changed: there is no conflict. Over time, I have differentiated my position, but fundamentally its clear to me that science (any form of science, not just evolution) cannot contradict faith. Truth cannot contradict truth. This means there must be a fundamental unity to truth. No matter how we discover truth; whether it is using the scientific method, literary criticism, depth psychology, economics, critical reflection, or whatever, what we discover is part of a unified whole. Pope Francis roots this unity in the light shining forth from the life of Jesus. This light is perceived through the spiritual senses and is born of an encounter with Jesus. It is clarified through discernment primarily through the life of the believer in the church. This method is distinct from the scientific method but has a long tradition and pretty clear processes. Religion has data and method, they are simply different from those of science. A few years back I co-taught a course at the University of Wyoming on Science and Religion. We used a text by Ian Barbour that outlined four paradigms for the interaction of science and religion (Conflict, Independence, Dialogue, and Integration). Pope Francis’ discussion of faith, rooting itself in Augustine’s “philosophy of light” falls in the integration camp (for more information see the Magis Center of Reason and Faith). While dialogue is essential, at its deepest point, the life of Jesus integrates all ways of knowing. Faith and reason can teach each other wonder and humility. Truth is one. It all fits together in some wonderful way. How do you make sense out of the world? What role does faith play in your life? What about reason? Science? How do they relate? Picking up with the third section of Chapter 2…. “Faith comes from hearing” (Rom 10:17). Faith, and the knowledge born of faith is personal. it recognizes the voice of the one speaking, opens up to that person in freedom and follows him or her in obedience (29). Thinking of faith as hearing emphasizes the fact that faith unfolds in time. This has a different emphasis than thinking of faith as seeing which provides a comprehensive picture all at once. Hearing emphasizes personal vocation and obedience, and the fact that truth is revealed in time. Sight provides a vision of the entire journey and allows it to be situated within God’s overall plan… (29). Ultimately, faith as hearing and seeing becomes united in the person of Jesus. How does one attain this synthesis between hearing and seeing? It becomes possible through the person of Christ himself, who can be seen and heard (30). This focus on the person of Jesus moves us outside of ourselves. This means that faith-knowledge does not direct our gaze to a purely inward truth. The truth which faith discloses to us is a truth centred on an encounter with Christ, on the contemplation of his life and on the awareness of his presence (30). Beyond conceiving faith as hearing and sight, faith can also be understood as touch. Saint Augustine, commenting on the account of the woman suffering from haemorrhages who touched Jesus and was cured (cf. Lk 8: 45-46), says: “To touch him with our hearts: that is what it means to believe” (31 emphasis added). Christian faith is fundamentally incarnational. As a kid I was fascinated by ESP, telepathy and other psychic phenomenon. This section of Lumen Fidei explores faith from the perspective of “spiritual senses.” Just as we have physical senses, we have spiritual senses. These spiritual senses play a vital role in our faith because they put us in contact with Jesus. Our eyes connect us with the physical world around us, so our spiritual eyes connect us with the spiritual world around us. The same is true for our spiritual ears, hands, maybe even noses. Saint Benedict exhorts his monks to “Listen with the ear of the heart.” And St. Augustine sees the spiritual journey as “healing the eyes of the heart” (5). Pope Francis comes from this tradition when he writes of faith as a form of hearing, sight, or touch. (He could also have included the senses of smell and taste, I suppose). Using the analogy of senses to describe faith helps us to understand the various ways faith is experienced. The experience of faith is multi-dimensional. Examining the reality of faith through the analogy of our senses enriches our experience. All of this discussion of “spiritual senses” only makes sense due to the incarnation. Senses put us in touch with something outside ourselves. Faith puts us in touch with Jesus. Sometimes, through faith, we hear Jesus voice. Sometimes we see his face. Sometimes we feel his healing touch. Exploring our faith through the lens of spiritual senses can lead us to a deeper, richer, more complete experience of Jesus. How is your faith like hearing, seeing, or touching? Which “spiritual sense” do you utilize the most? Picking up with the second section of Chapter 2…. Faith and knowledge of the truth are linked through the heart. “One believes with the heart” (Rom. 10:10). the heart is the core of the human person, where all his or her different dimensions intersect: body and spirit, interiority and openness to the world and to others, intellect, will and affectivity (26). It is faith’s connection to love that opens it to truth. Faith knows because it is tied to love, because love itself brings enlightenment. Faith’s understanding is born when we receive the immense love of God which transforms us inwardly and enables us to see reality with new eyes (26). This love is more than emotion. It is a love that “aims at union with the beloved” (27). Therefore it is a love grounded in truth. We can only attain union with the beloved when we know the beloved. Because it is born of love, the knowledge of faith is primarily relational. It is a relational way of viewing the world, which then becomes a form of shared knowledge, vision through the eyes of another and a shared vision of all that exists (27). Faith-knowledge is rooted in God’s covenant with his people. It is born from a trust in God’s fidelity. God has been faithful in the past. He will be faithful now and in the future. Faith-knowledge, because it is born of God’s covenantal love, is knowledge which lights up a path in history… the true God is the God of fidelity who keeps his promises and makes possible, in time, a deeper understanding of his plan (28). Because, in faith, we are aware of God’s love for us, his plan becomes clearer and clarifies all of history. Faith-knowledge sheds light [on] …the entire history of the created world, from its origins to its consummation (28). I realize I got a bit too detailed in parts 1 and 2 of this discussion of Lumen fidei. I’ll keep it shorter and more focused this time…. This chapter begins with a discussion of Is 7:9 and the understanding presented there of faith as standing fast. The prophet [Isaiah] tells him [Ahaz] … to trust completely in the solid and steadfast rock which is the God of Israel (23). hold together times and ages, and to gather into one the scattered strands of our lives (23). Recognizing and trusting this power of God (faith) gives believers a place to stand. It is certain knowledge (truth) which provides the needed foundation to move forward. This knowledge is not a mere feeling, nor is it technical know-how, nor is it my own personal truth (as real as that may be). This knowledge is a profound awareness of the power of God guiding creation to its fulfillment which gives purpose and meaning to everything. With this presence of a mediator in its midst, Israel learns to journey together in unity. The individual’s act of faith finds its place within a community, within the common “we” of the people who, in faith, are like a single person — “my first-born son”, as God would describe all of Israel (cf. Ex 4: 22). Here mediation is not an obstacle, but an opening: through our encounter with others, our gaze rises to a truth greater than ourselves (LF 14). As a mediator, Moses provides a focus for faith, uniting the people in a common faith and opening them to new possibilities. complete manifestation of God’s reliability… In the love of God revealed in Jesus, faith perceives the foundation on which all reality and its final destiny rest (LF 15). This foundational reality is love which is expressed most fully in Jesus death for us. The clearest proof of the reliability of Christ’s love is to be found in his dying for our sake… This love, which did not recoil before death in order to show its depth, is something I can believe in; Christ’s total self-gift overcomes every suspicion and enables me to entrust myself to him completely (LF 16). Christians, on the contrary, profess their faith in God’s tangible and powerful love which really does act in history and determines its final destiny: a love that can be encountered, a love fully revealed in Christ’s passion, death and resurrection (LF 17 emphasis added). Faith, born of the encounter with a loving God changes the way Christians see reality. They see with the eyes of faith; a faith which sees with the eyes of Jesus. Faith does not merely gaze at Jesus, but sees things as Jesus himself sees them, with his own eyes: it is a participation in his way of seeing (LF 18). This has implications for the way Christians live their lives. When reality is seen through the eyes of faith it calls Christians to engage life at its profoundest level. Far from divorcing us from reality, our faith in the Son of God made man in Jesus of Nazareth enables us to grasp reality’s deepest meaning and to see how much God loves this world and is constantly guiding it towards himself. This leads us, as Christians, to live our lives in this world with ever greater commitment and intensity (LF 18). This new way of seeing also reveals the Christian’s (and indeed all creation’s) radical dependance on God’s foundational gift. Everything is seen in the light of God’s gift. This is salvation: knowing the gift of God in Jesus. Salvation by faith means recognizing the primacy of God’s gift. As Saint Paul puts it: “By grace you have been saved through faith, and this is not your own doing; it is the gift of God” (Eph 2: 8) (LF 19)… Faith’s new way of seeing things is centred on Christ. Faith in Christ brings salvation because in him our lives become radically open to a love that precedes us, a love that transforms us from within, acting in us and through us… Faith knows that God has drawn close to us, that Christ has been given to us as a great gift which inwardly transforms us, dwells within us and thus bestows on us the light that illumines the origin and the end of life (LF 20). Faith’s insight transforms the believer. Everything is made new. It also joins the believer to the church. Faith is not a private matter, a completely individualistic notion or a personal opinion: it comes from hearing, and it is meant to find expression in words and to be proclaimed. For “how are they to believe in him of whom they have never heard? And how are they to hear without a preacher?” (Rom 10: 14). Faith becomes operative in the Christian on the basis of the gift received, the love which attracts our hearts to Christ (cf. Gal 5: 6), and enables us to become part of the Church’s great pilgrimage through history until the end of the world. For those who have been transformed in this way, a new way of seeing opens up, faith becomes light for their eyes (LF 22). These considerations on faith — in continuity with all that the Church’s magisterium has pronounced on this theological virtue[ 7] — are meant to supplement what Benedict XVI had written in his encyclical letters on charity and hope. He himself had almost completed a first draft of an encyclical on faith. For this I am deeply grateful to him, and as his brother in Christ I have taken up his fine work and added a few contributions of my own. (LF 7). 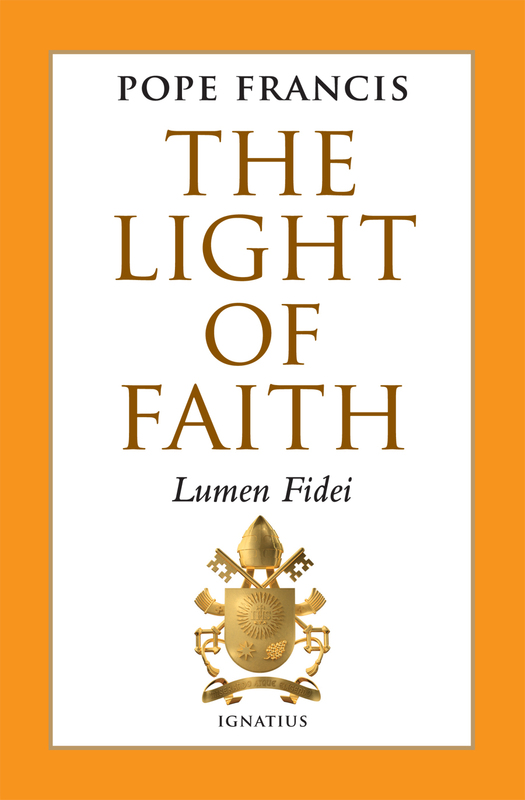 Lumen Fidei can, in a certain sense, be read as a completion of this “trilogy” and a final teaching from Benedict XVI. After a brief introduction highlighting the need for a recovery of faith in the contemporary world, the encyclical is divided into four parts. The first part “We have believed in love” traces the faith of Israel beginning with Abraham and leading to faith in Christ. This chapter lays the scriptural and philosophical foundation for the rest of the encyclical. At its foundation, faith is personal. Faith is our response to a word which engages us personally, to a “Thou” who calls us by name (LF 8). Faith accepts this word as a solid rock upon which we can build, a straight highway on which we can travel… The man of faith gains strength by putting himself in the hands of the God who is faithful (LF 10). Faith is both surprising and somehow expected. God’s word, while bringing newness and surprise, is not at all alien to Abraham’s experience (LF 11). This journey of faith which begins with Abraham is deepened and purified in the history of God’s People, Israel. Israel trusts in God, who promises to set his people free from their misery… God’s light shines for Israel through the remembrance of the Lord’s mighty deeds, recalled and celebrated in worship, and passed down from parents to children (LF 12). Idols lead to selfishness and confusion. Idols exist, we begin to see, as a pretext for setting ourselves at the centre of reality and worshiping the work of our own hands. Once man has lost the fundamental orientation which unifies his existence, he breaks down into the multiplicity of his desires; in refusing to await the time of promise, his life-story disintegrates into a myriad of unconnected instants. Idolatry, then, is always polytheism, an aimless passing from one lord to another. Idolatry does not offer a journey but rather a plethora of paths leading nowhere and forming a vast labyrinth. Those who choose not to put their trust in God must hear the din of countless idols crying out: “Put your trust in me!” (LF 13). consists in the willingness to let ourselves be constantly transformed and renewed by God’s call. Herein lies the paradox: by constantly turning towards the Lord, we discover a sure path which liberates us from the dissolution imposed upon us by idols (LF 13).